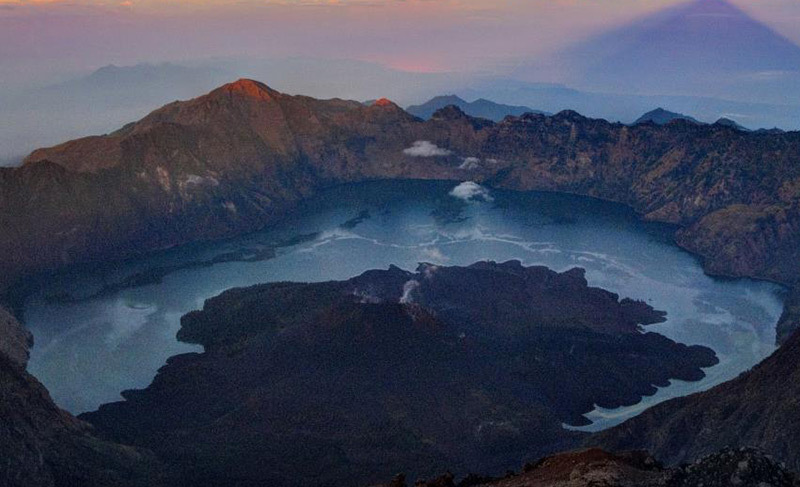 Mount Rinjani is located in the northern of Lombok, West Nusa Tenggara. Mount Rinjani has a height of more than 3,700 meters above sea level is the second highest volcano in Indonesia and is a prime tourist spot on Lombok island. Mount Rinjani has the most beauty natural scenery when compared with other mountain in Indonesia, even beauty touted as the most beautiful not only in Indonesia, but also in Asia. Because of this beautiful scenery of Mount Rinjani became favorite mountain climbers who usually are students, nature lovers, locals, to foreign tourists. Beside the beautiful of panoramic, Mount Rinjani also has attractive the variety of flora and fauna. When you are trekking in Mount Rinjani, you will treated the view of spruce and edelweiss flower. Or fauna that you can meet more than 100 different species of birds, hedgehogs, deer, monkeys silver, long-tailed monkeys, and others.